The visibly frail 73-year-old Zeman abruptly announced a press conference yesterday afternoon, raising speculation about his possible resignation. 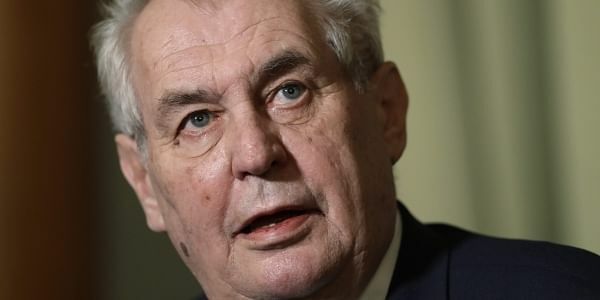 PRAGUE: Czech President Milos Zeman, known for showing hostility towards journalists, taunted them yesterday, saying he regretted making them look like "little idiots" during a bizarre event in which he set a huge pair of red underpants on fire. "I apologise to the journalists whose intelligence I tested, unsuccessfully as always," Zeman told reporters gathered for the briefing the gardens of Prague Castle where he was flanked by his spokesman, assistants and several firemen. To their amazement, Zeman then proceeded to burn a huge pair of red underpants in a fire pit, assisted by two firemen dressed in full gear. "The time of underwear in politics is over," Zeman declared. "I'm sorry to make you look like little idiots, you really don't deserve it," he told reporters before leaving in his car. The red underpants, measuring roughly one square metre, resembled a pair that Czech pranksters had flown from a flag pole atop the presidential palace in 2015 in protest against Zeman. The pranksters said that the red colour of their boxer-short style protest flag symbolised the unhealthily close link they believed Zeman, a former communist, had with China and Russia. Staunchly pro-Russian and pro-Chinese, Zeman once dubbed journalists "manure" and "superficial" before telling Russian President Vladimir Putin in China in May 2017 that "journalists should be liquidated". He also showed up at a press conference in October 2017 with a toy Kalashnikov in his hand labelled "for journalists". Zeman narrowly won a second consecutive term in January elections, beating his pro-European liberal rival Jiri Drahos in a knife-edge run-off that underscored deep divisions in the EU and NATO state. Zeman's stunt drew a barrage of criticism on Thursday, with Jiri Pospisil, leader of the right-wing TOP 09 party, exclaiming "let us wake up from this nightmare!" Zeman's health has come under heavy scrutiny in recent months. He walks with a cane, is diabetic and is a former heavy drinker and smoker.